The use of RDP (remote desktop protocol) creates risk because it has the ability to control a computer remotely and usage should be closely regulated, monitored and controlled, say the FBI and US Department of Homeland Security. Malicious cyber actors have developed methods of identifying and exploiting vulnerable RDP sessions over the internet to compromise identities, steal login credentials and ransom data, the two US agencies said in a joint public service announcement. The use of remote administration tools, such as RDP, as an attack vector has been on the rise since mid- to late 2016 with the rise of dark markets selling tools for RDP access. RDP is increasingly popular with cyber attackers because it allows an individual to control the resources and data of a computer over the internet. Cyber actors can infiltrate the connection between the machines and inject malware or ransomware into the remote system, and because attacks using RDP do not require user input, intrusions are hard to detect. 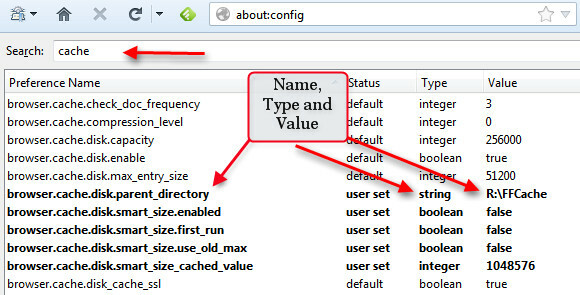 Vulnerabilities include weak passwords that allow attackers to initiate RDP connections, outdated versions of RDP with weak encryption mechanisms that enable man-in-the-middle attacks, allowing unrestricted access to the default RDP port (3389), and allowing unlimited login attempts to a user account. Threats include ransomware such as CrySiS, which targets businesses through open RDP ports; CryptON, which uses brute-force attacks to gain access to RDP sessions; and Samsam, which uses a wide range of exploits, including ones attacking RDP-enabled machines, to perform brute-force attacks. In July 2018, Samsam threat actors used a brute-force attack on RDP login credentials to infiltrate a healthcare company and encrypt thousands of machines before detection, the FBI/DHS alert said. Threat actors are also known to buy and sell stolen RDP login credentials on the dark web, with the value of credentials being determined by the location of the compromised machine, software used in the session, and any additional attributes that increase the usability of the stolen resources. In just two and a half years, SamSam campaigns are believed to have netted nearly $6m for cyber criminals. Adversaries have started becoming more interested in older protocols, including Microsoft’s remote desktop protocol. RDP is challenging drive-by-download as the top infection vector for ransomware. In August 2018, researchers at security firm Cybereason reported that a honeypot designed to look like a power transmission substation of an electricity supplier was discovered within two days and prepared for sale as an asset on the dark web to another criminal entity using the tool xDedic RDP Patch. The tool allows a victim and an attacker to use the same credentials to log in to a machine simultaneously using RDP, which would otherwise be impossible because of built-in security restrictions in the latest versions. Daily RDP incidents skyrocketed in May, with attackers going for backups in most cases, according to a report on malicious activity in the second quarter of 2018 by security firm Rapid 7. The report said there is a consistent level of activity with RDP in the second quarter with peaks of activity, such as one in May that saw more than one million probes. “Monitoring for brute-force activity, suspicious multi-country authentication and multi-organisation authentication helps to identify this type of activity, and implementing multi-factor authentication and monitoring for leaked credentials can help organisations actively protect themselves from these threats,” the report said. Understanding exposures is another critical aspect to combating the threats, the Rapid 7 report said, noting that externally exposed RDP – even for a short period of time – can have a devastating effect on an organisation, as was shown by several of the RDP-enabled ransomware attacks in the second quarter. Audit networks for systems using RDP for remote communication and disable the service if unneeded or install available patches. Verify that all cloud-based virtual machine instances with a public IP do not have open RDP ports, specifically port 3389, unless there is a valid business reason to do so. Apply two-factor authentication where possible. 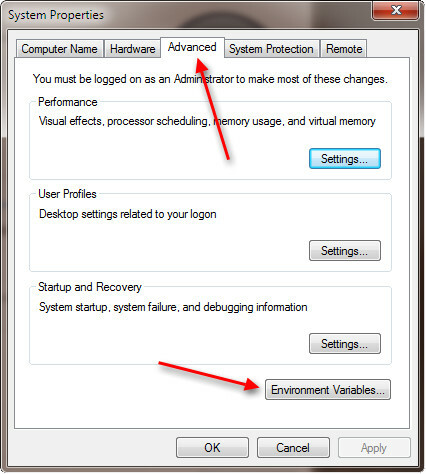 Minimise network exposure for all control system devices and, where possible, disable RDP for critical devices. Regulate and limit external-to-internal RDP connections. When external access to internal resources is required, use secure methods, such as VPNs. Should You install a RAMDrive? RAMDrives (also called RAMDisks) use, uh… RAM (Random Access Memory). That means that if you don’t have enough to begin with then a RAMDrive is not for you. If you’re running Windows 7 (64-bit) then the sweet spot according to all the benchmark articles I have read is about 4GB. If you have more than 4GB of RAM installed on your system then you are a candidate for a RAMDrive. If not, then you should probably get more RAM in order to qualify for this exercise. Adding a RAMDrive in this case will only lower the amount of memory within which Windows has to operate. That’s not a good thing. We want to speed things up, not slow them down. The concept is simple. A RAMDrive is a utility that sets aside a portion of available RAM and fools Windows into thinking it is an actual internal hard drive connected to your computer. It will be treated like any other drive; it will show up in Windows Explorer or any other file manager of your choosing. RAMDrives are volatile. That means that just like anything else stored in RAM, it is gone when you shut down your computer. RAMDrives are blazingly fast. Faster even than your Solid State Drive. What RAMDrive is the best? And what do I use? This is a valid question. The answer is to get yourself a RAMDrive that will allow you to save all that data between re-boots. I don’t know of many that will, but I do know of one and it is what I use. It is published byDRDataRAM. They are in the business of selling RAM but they also provide this wonderful product for free. Note 1: Please disregard the branding. This is a version that was provided by AMD. I wanted to see if there were any differences between this and the DRDataRAM version and there were not. I simply never uninstalled this version and it happens to be the only image I have available on my computer. 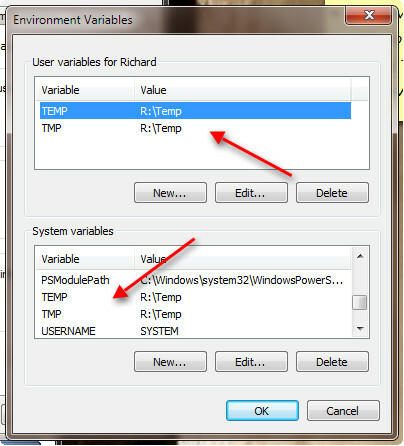 Note 2: Setting these options will add to the Start and Shutdown times of Windows. This small sacrifice is definitely worth the speed increase while you are actually using your computer. What You Should Put on a RAMDrive? Specialized tasks — Video rendering? Audio mixing? These are prime candidates. 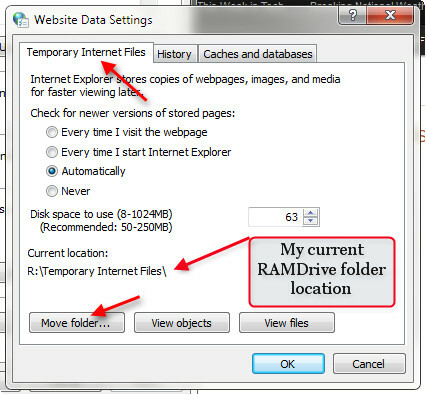 The Page File – Absolutely do not consider putting your Page File on a RAMDrive. This is totally counter-intuitive and I can’t, for the life of me, understand why this idea is perpetuated. Even among the tech élite. It makes no sense to me. Consider this – The reason a Page File exists is to have a place to store stuff when Windows runs out of RAM. If you need a Page File in the first place, then you don’t have enough RAM in the first place, and you certainly don’t have the luxury of using some of it for a RAMDrive. Now you want to put a Page File on the RAMDrive that you can’t afford? Arghhh! I have spouted this point ad infinitum and still I see members of the tech community, some of whom I admire incidentally, who still don’t seem to ‘get it’. If you have tons of RAM, and don’t need a Page File, but there are some antiquated programs you’re using that won’t run without one, then maybe, just maybe, I’ll back off a tad. One example of such a program is Acronis. This is what I use to back up my computer on a daily basis. I have 16GB of RAM installed on this system and Acronis still insists on using a Page File. Doh. Perhaps newer versions have fixed this ridiculous problem. If you have 4GB or less on a Windows 7 machine, then first consider springing for some more RAM. Even without a RAMDrive, Windows will be happier. You know, more breathing room. When it stops needing a Page File, then you know you have enough. Before the advent of Solid State Drives I always promoted buying more RAM. It was, and may still be, the biggest bang-for-the-buck investment you can make when considering a computer upgrade solution. SSD’s will speed up your computer like nobody’s business, but it is a more costly proposition. A RAMDrive will knock the socks off an SSD, but you have to have the extra RAM installed first. Note: If you are not running a 64-bit system, then the 4GB issue becomes moot. 32-bit systems cannot use more than 4GB of RAM. There are exceptions to this rule but that is beyond the scope of this article. If you have the available RAM, I strongly advise you to try out a RAMDrive. It will speed up your computer in ways you might not imagine. 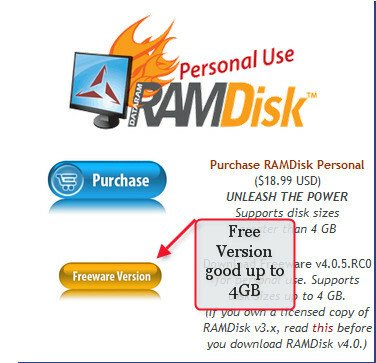 You can get your free RAMDrive at this DRDataRAM download page. Disclaimer: I am not in any way affiliated with DRDataRAM. I use the utility because I happen to like it and simply want to pass this information on to you. If you would like to know more about using this particular RAMDrive solution, or if you have questions or suggestions please leave a comment below. A week ago I wrote an article about RAMDrivesand my thoughts about them; I wrote about how I thought they should and should not be used. You can read all my rants and raves in the originalRAM disk article. In any case, today I would like to talk about the RAM disk software itself. Namely, DrDataRAM. This is a very lengthy article with lots of information so I’m breaking it down into two parts so it is easier to digest. This is part 1 of 2. What I specifically like about this particular software is that you can save your work between re-boots. This is an option not often offered by many RAM disk solutions. DrDataRAM is a great piece of work. In my limited experience it is the best RAMDrive solution available, hands-down; this is especially true when you consider the great price – free. Granted, they are in the business of selling RAM. This does not mean they have sloughed their diligence with this RAMDrive product. To the contrary, they have done a great job of it. Disclaimer: I must point out that I have no relationship with DRDATARAM nor will I receive any remuneration from their organization for promoting their software. I simply like the product and want to share my experiences with you. Now that I’ve covered my Wisconsinian derriere (dairy air), I will proceed to show you how to use this fine utility. If you’d like to follow along, you can get your free copy of DrDataRAM at their site. DRDataRAM does not change its settings until you re-boot the system (read: until you re-start DRDataRAM) . This is an important point. Here’s an example: Let’s say you want to save your RAM Drive when the computer shuts down. So, you change the DRDataRAM settings to reflect those wishes. Now you shut down your computer expecting those changes to be saved. Wrong! It won’t happen until the RAM Driver is re-loaded. That means it’s too late. You need to save the RAM Drive image after you make the changes, but before you re-boot your computer. I’ll return to this a little later. Think about where you would like to save the Image File. It will be as large as your RAM Drive so consider this when making your choice. Also, if you plan to load this file at every re-boot, you might want to consider putting it on a fast drive so it won’t slow down your boot time too much. In the following examples, I’ll show you what I do when I first install this utility and how I use it on a regular basis. The first thing you should notice are the tabs at the top of the DrDataRAM window. Note 1: Please ignore the AMD Radeon branding in this and any following images. This utility is identical to the DrDataRAM product we are discussing. The reason for this difference is that I thought I’d try the AMD version and never uninstalled it. It was an AMD promotion a while back. I discovered there was absolutely no difference between the two. Note 2: You’ll notice in the above image that a maximum size available is 15780MB. The free version has an upper limit of 4GB. The paid version is limited only by the amount of RAM installed in your computer. Note 3: I usually set it up as Unformatted, When I re-boot I have Windows format it with a FAT32 file system, then save the RAM Drive image to a hard drive. This may sound confusing now but I hope to clear this up for you in the following paragraphs. 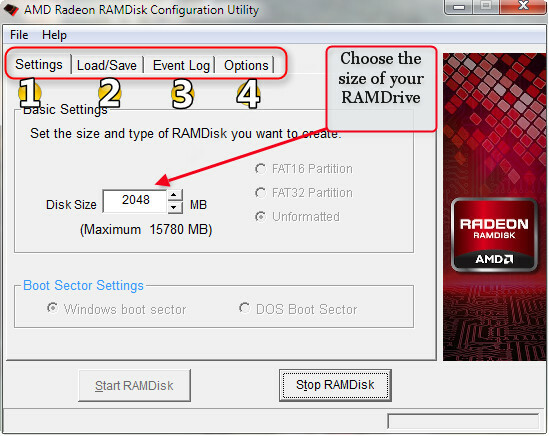 Under the first tab labeled “Settings” you will decide the size of your new Ram Drive. If you plan on using the Ram Drive only for browser cache files (recommended) and System and User Temporary Files (also recommended) then a 2GB choice is more than adequate. 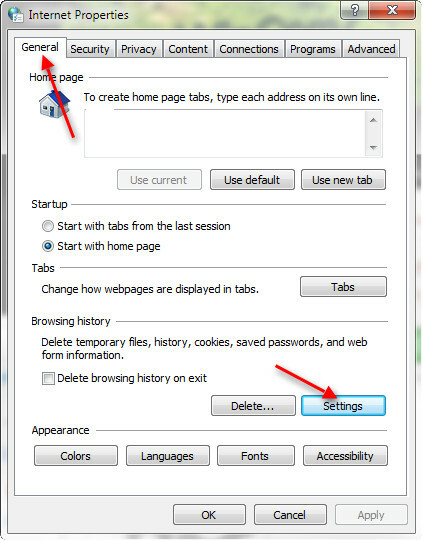 There are several choices to make under the Load/Save tab. The first thing you should probably do is decide where you want to store a copy/image of the Ram Drive. Since Loading/Saving this rather large file will slow down your Windows boot and shut-down times, it’s probably a good idea to put this on a relatively fast drive. The extra time spent for the boot/shut-down times is a small price to pay for the much faster computing experience delivered while you are actually using your system. I don’t mind waiting a few seconds longer for a computer to shut-down or start up. After all, I’m not using the computer when that is happening. I want speed while I’m actually working with it. Loading this image when Windows boots is vital if you want to start with the same information you had at shut-down time. If you store critical data on the RAM Drive (not recommended) then saving the image at Windows shut-down is also important. 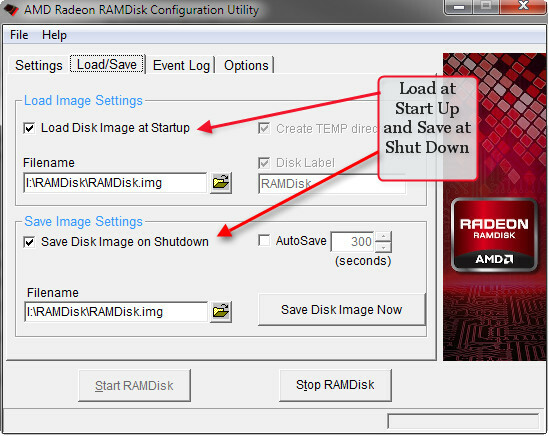 There is also an option to AutoSave the RAM Drive at intervals measured in seconds. First I create all the folders that I know I’m going to be using. They include a Temp folder for, well, Temporary Files. Then I create folders for the individual cache files for various browsers I use. I usually have three to four browsers running at any given time, so I set up four folders—one for each browser. I also like Google Earth and Google Earth in turn likes to create lots of cache files. This is perfect for a RAM Drive. Even though I have the Recycle Bin disabled for this drive, apparently Windows cannot resist the urge to put the directory in there anyway. In my opinion a Recycle bin on a RAM Drive is a total waste of resources. I always disable it for that drive. Now, here’s that headache thing I told you about. Once you get all your directories set, hit that Save Disk Image Now button!! So the caveat here is this: Always save a copy of the RAM Drive whenever you change any settings. It took me a bit of time to get a handle on the way this worked and was the cause of many re-boots, restarts and repetitive settings changes. 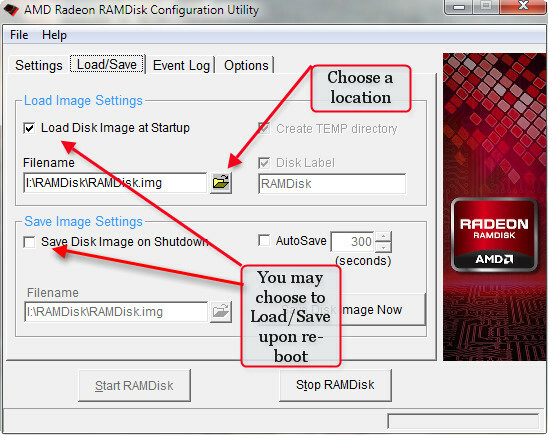 If you want to retain this structure between re-boots put a check in the box labeled Load Disk Image at Startup!! Once I have the RAM Drive set up to my liking there is no need for me to save the image at every shut down. I just have it loaded at boot time. In fact, if you’d like to have no traces of your browser caches left, you can simply set up all the empty folders you like, save it in that state, and it will effectively load empty caches at every boot. This might be a tantalizing idea to the more privacy-conscience folks out there. DrDataRAM keeps a log of events, both informational and warnings. I have never seen a single bad event listed. Under the Options tab, there are some additional choices for you to fine-tune some settings. In part 2 I’ll delve into actually implementing the RAM drive on your computer – where you’ll see huge performance increases, but if you can’t wait and prefer to work ahead you can turn to DrDataRAM Support Page for useful information.